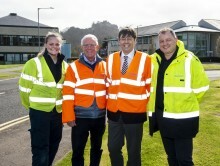 Stirling MSP Bruce Crawford today visited Openreach engineers working on an installation of the next generation of broadband technology for new homes in Raploch. He saw a ‘full-fibre’ network built directly to the properties to deliver ultrafast internet connections. The future-proof services can carry speeds up to 1Gbps - 21 times faster than the UK’s current average. Perthshire North MSP John Swinney has been shadowing Openreach engineers to see the progress of high-speed broadband locally, including the next generation of technology. During the field visit the Deputy First Minister visited a new ‘full-fibre’ network in Innerleithen Way in Perth, where he watched a step-by-step demo of how it’s installed. Borders MP John Lamont has been shadowing Openreach engineers in his constituency to see the progress of high-speed broadband locally. The MP heard about the next generation of broadband technology – future-proof, ‘full-fibre’ services capable of carrying speeds up to 1Gbps* – and how engineers are using innovative new techniques to bring more reliable, faster broadband to rural communities.